I finally got around to picking up a copy of this split 7". I delayed a bit longer than I normally would, so I was relieved that I was still able to grab the blue vinyl that was limited to 100 copies. Dan Padilla is a band that's been kicking around for quite a few years and I've reviewed several of their releases over the years on this website. The two songs on this 7", perhaps two of the last songs the band will ever release, are on par with anything they've put out in the past. I really dig both of them. 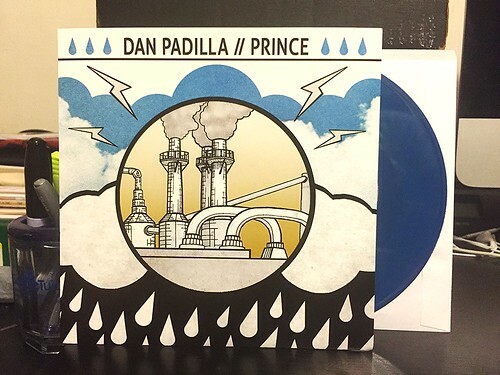 Dan Padilla has always been a band that takes a slight rootsy approach to their punk rock. You can hear echoes of a Tom Petty vibe buried in their songs, but they still put forth the sort of energy and passion that you'd expect from a Leatherface. I still don't know what to make of the band Prince. Well, I should clarify that, I've absolutely loved ever song I've heard from them so far, but I don't really know a ton about them. I did a little creative googling (you probably wouldn't be surprised to find out they are difficult to search for these days) and it looks like they're going to start working on a full length soon. I'm pretty excited about that as their contribution to this split is just stellar. Fast and catchy with lots of hooks, just the way I like. Counting down the days to that full length.